EU leaders will meet at 17:00 BST for an emergency summit in Brussels to decide whether to offer the UK another delay to Brexit. Theresa May wants to postpone the UK's exit beyond this Friday, until 30 June. But the EU is expected to offer a longer delay, after European Council President Donald Tusk urged the other 27 leaders to back a flexible extension of up to a year - with conditions. Mr Tusk added that "neither side should be allowed to feel humiliated". Leaders will begin arriving at the summit from 16:00. Earlier, Mrs May appeared in the Commons for the weekly question session with opposition leader Jeremy Corbyn at Prime Minister's Questions. 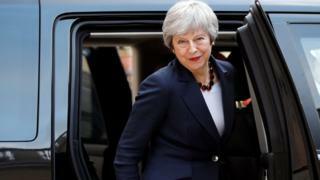 The 1922 Committee - made up of Tory backbench MPs - will also meet at 17:00, with some members seeking a firm date for Mrs May to step down as leader of the party. To prevent this happening, a group of backbench MPs managed to get a bill through Parliament to force Mrs May to ask for an extension to Article 50 - the process that defines the UK exit date - by law. 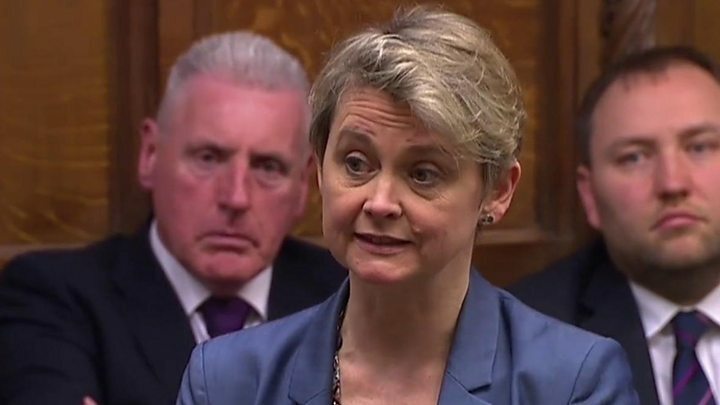 BBC political editor Laura Kuenssberg said the PM had to convince EU leaders about the credibility of talks with Labour and prove they were "a genuine political plan that has a chance of getting the UK out of this maze". So, at the summit - which begins at about 18:00 local time (17:00 BST) on Wednesday evening - Mrs May will formally present her case for a short delay, with the option for the UK to leave earlier if her Brexit deal is ratified. In a formal letter to the leaders on the eve of the summit, Mr Tusk proposed a longer, flexible extension - although "no longer than one year" - to avoid creating more cliff-edge extensions or emergency summits in the future. Any delay should have conditions attached, he said - including that there would be no reopening of the withdrawal agreement talks. And the UK would have the option to leave earlier if a Brexit deal was ratified. Referring to Mrs May's proposal for an extension until the end of June, Mr Tusk said there was "little reason to believe" that Mrs May's deal could be ratified by then. And if the European Council did not agree on an extension at all, "there would be a risk of an accidental no-deal Brexit", he added. EU officials have also prepared a draft document for the leaders to discuss at the summit - but the end date of the delay has been left blank for the EU leaders to fill in once deliberations have ended. BBC Europe editor Katya Adler said the blank space showed EU leaders were still divided on the issue. BBC Europe correspondent Kevin Connolly said "much has been spelled out in advance", including the condition that if the UK remains a member of the EU at the end of May it will have to hold elections to the European Parliament or be forced to leave immediately. He added that, during the delay, the UK would be expected to commit to not disrupting EU business, such as the preparation of the next budget, and its influence "would be sharply reduced and its voice muted". 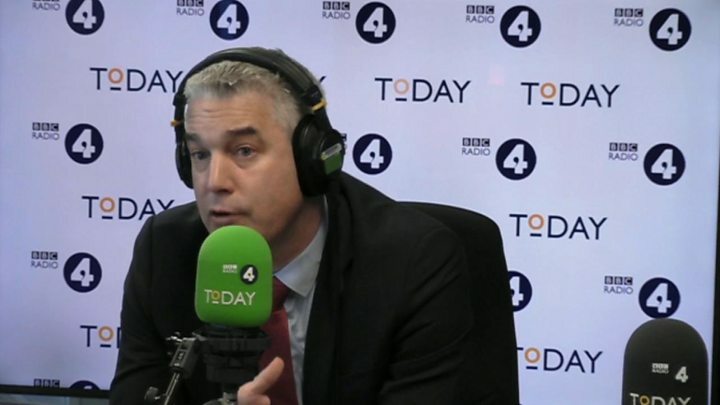 Brexit Secretary Stephen Barclay said neither he nor the PM wanted to see a longer extension, but it was a possibility because MPs had not backed Mrs May's deal. But others have called for the UK to leave the EU on Friday without an agreement. Tory Brexiteer Anne Marie Morris told BBC News that exiting on World Trade Organisation rules - the default if the UK leaves without an agreement - was "actually a very good deal" for the country. Other Leave-supporting backbenchers are seeking an exit day for Mrs May, after she vowed to step down ahead of the second phase of Brexit negotiations. Former Conservative leader Iain Duncan Smith said although the PM had "hinged" her resignation on MPs supporting her deal, the "reality" is her "firm date of departure" should be in May or June. "To have a leadership contest in the Conservative Party is going to take the better part of 10 to 11 weeks, and that will take you to the autumn, so this thing is going to have to happen," he told the BBC. But some in Westminster back a longer extension, saying it would give time for another referendum to take place. 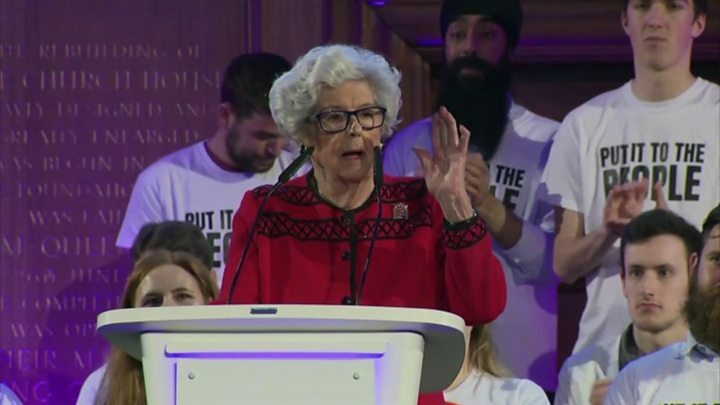 The People's Vote campaign held a rally on Tuesday to drum up support, with former Speaker of the House, Baroness Boothroyd, calling for a public ballot. Media captionPeople's Vote: Betty Boothroyd says "nobody voted for this mess"
The Brexit Secretary, Stephen Barclay, said holding talks with the opposition was "contrary to the normal tradition", but they were taking place "in good faith". A Labour spokesman said the discussions were being conducted "in a serious, detailed, and engaged way", but they had "yet to see clear evidence of real change and compromise that would be necessary to find agreement".